This is one of the quickest and most addictive lunch snacks you can imagine – and it’s healthy! 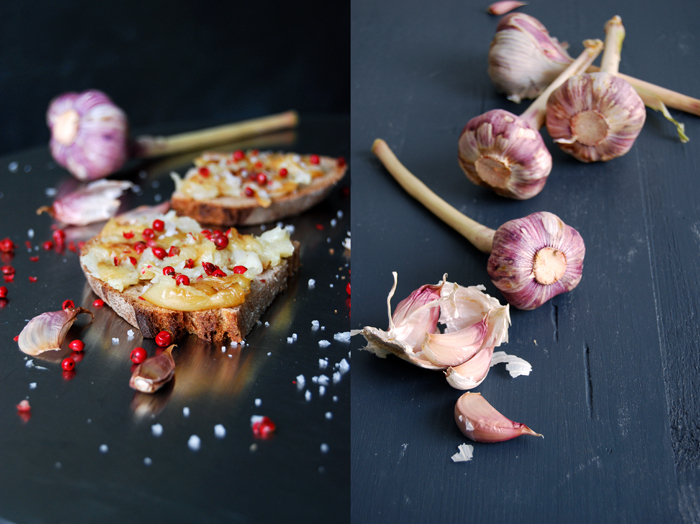 With just one bite I had 3 cloves of roasted garlic in my mouth, enjoying its smooth texture and aromatic taste refined with pretty pink peppercorns and my flaky sea salt from Gozo. 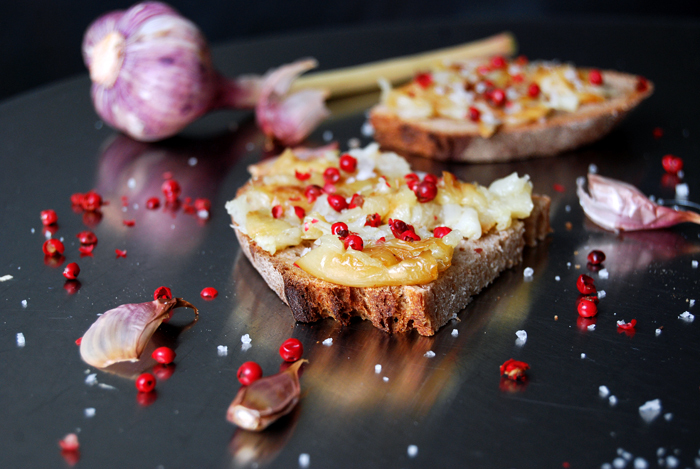 I roasted lots of fleshy cloves from a young garlic bulb in the oven, you’ll need about 15 for 2 small tartines. They cooked in their skin for about 15 minutes before I mashed them with a fork onto the bread, smooth, slightly sweet and concentrated in flavour. I shared a similar sandwich with you, exactly a year ago, the same procedure but with grilled Gruyère cheese on top. It was good too, a bit more hearty and rich. 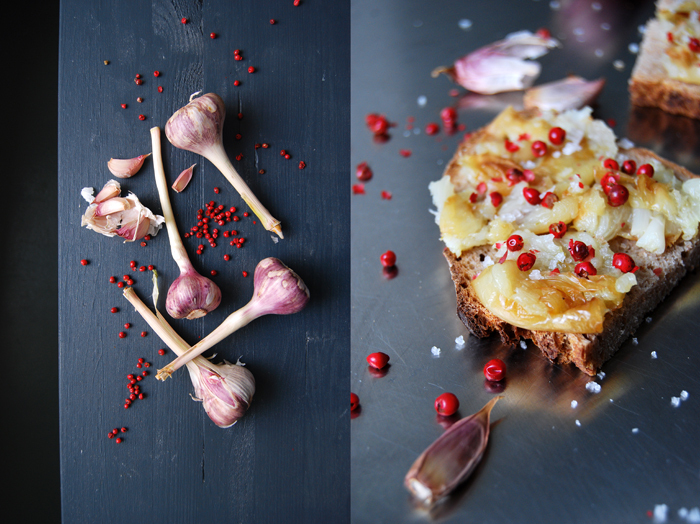 I could really eat garlic by the bulb (roasted, not raw!). I love its sweet spiciness, its bold taste. 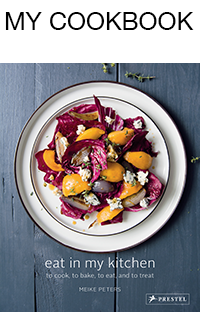 You could also purée the grilled and peeled cloves with a little salt and use it as a thin spread on bread. It’s so good for our bodies, known to be one of the oldest traditional remedies in the European and Asian culture. No additional medicine, you just have to eat well to feel good! Set the oven to 210°C / 410°F (fan-assisted oven). Roast the garlic in their skin on a tray in the oven for about 15-18 minutes, or until you can mash the cloves with a fork. Mind that they don’t get dark and hard! Peel and mash them with a fork on the bread, sprinkle with a little sea salt and pink peppercorns. Enjoy warm! Anything with garlic has to be delicious!